I think it was back in October that Sally, a member of the Franklins’ Monday P&Q class wore a super linen pinafore dress. Unfortunately it was shop-bought so no chance of a dressmaking pattern. 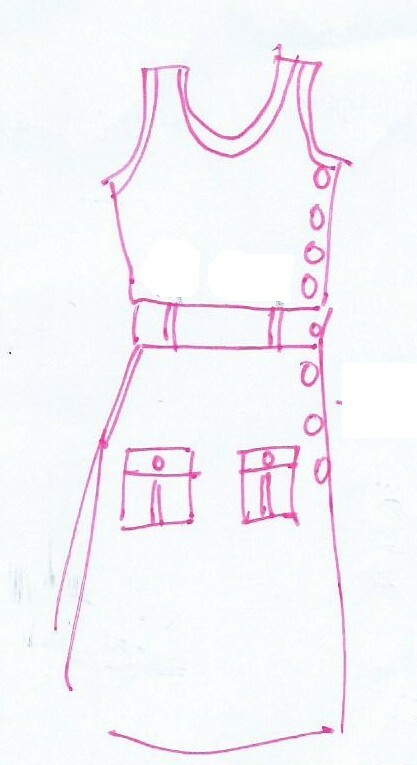 Instead, I asked Sally to stand still for a few moments whilst I quickly drew a sketch of the dress. Back home I studied the sketch and decided that with some work on my basic shift dress pattern I could make a similar dress in fabric of my choice and to fit me! So, to start with a dug out the basic bodice pattern that I have used so many times and traced it onto tissue paper. 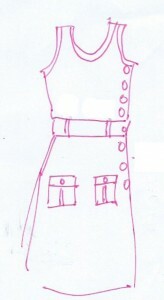 First, I re-drew the neckline and checked the shoulder width for a sleeveless garment. Then, moved the bust darts into the waistline line darts. I converted those darts to little pleats to be stitched to the waistband. The back bodice darts would remain as darts. I measured up from the waist seam and cut so that there could be a 2 ¾ inch wide waistband which would finish on or about my natural waistline. 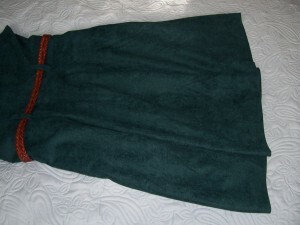 The waistband would also have belt loops incorporated into it, two at the front and two at the back. The complicated part of Sally’s dress was the fact that it had a side button fastening on the left-hand side. The opening starts under the armhole and continues down, includes the waistband and finishes further down the side of the skirt. Next the skirt pattern. I drew a basic A-line and converted the front darts to little pleats, leaving the back skirt darts as they were. I also checked that the pleats and darts in the skirt panels would align with the darts and pleats of the bodice above the waistband. To copy Sally’s dress the added complication to the side-button fastening was that there were, in addition to the inverted pleat and band patch pockets on the front of the skirt, also pockets set into the side seams of the skirt, So – lots of pockets! Having drafted the basic pattern I then cut out the bodice and waistbands in calico to make a toile. At the fitting of the toile I noted that I needed to reduce the front armhole. To do this I made a short dart which I then relocated into the waistline dart/pleats. I also needed to reduce the front bodice width by 2” at each side seam, starting at the join of the waistband and reducing to 0” at the underarm. That completed, I adjusted my pattern, re-drafted the pattern onto flip chart paper and made the appropriate notations. Now to start on the actual dress. I had intended to use a fine Navy needlecord that I bought in Fabricland’s Salisbury branch but before I cut into that fabric decided to make a “tester” garment using some “free” Forest Green “suedette” finish fine jersey fabric that I had been given by a neighbour when she had been clearing out a stash of dressmaking fabrics. Due to the sueded finish of the fabric I noted the nap and ensured that all pieces were cut in the same direction, I.e. With the pile running down the garment. As the fabric was a jersey there would be no need to finish the seam allowancess and because it was a synthetic fibre I decided that I would line the entire dress with anti-static lining which would make it hang well and so much nicer to wear. Firstly I cut out the bodice, waistband pieces and side pocket bags. I would leave the patch pockets until later as I was not sure whether to include them and would make my decision once the dress was made up. 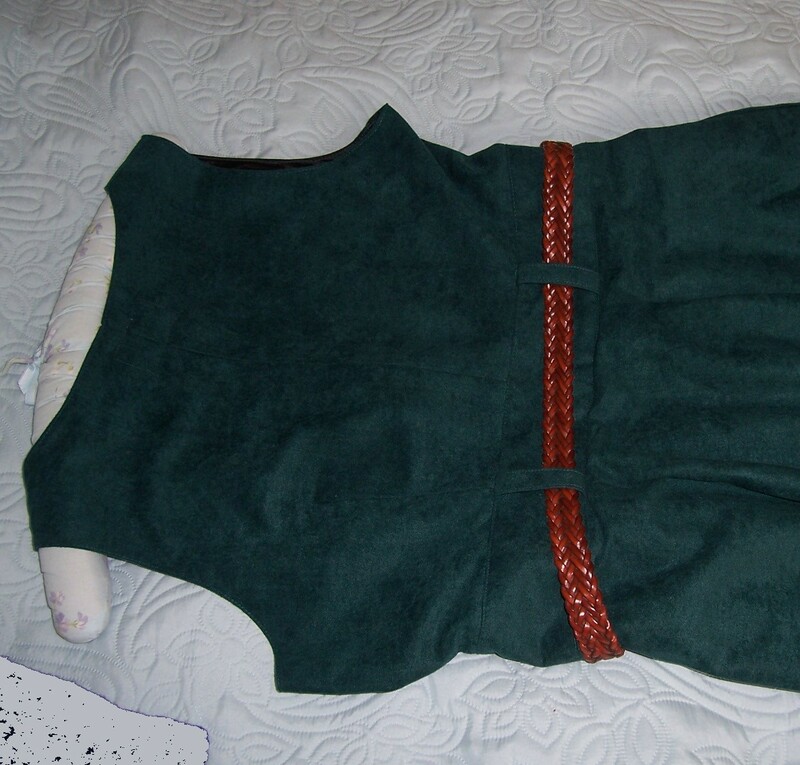 The bodice with the underlap for button closure on the left side went together well. I did stay-stitching around the neckline then stitched the little pleats on the front and made the darts on the back. I then stitched together at the shoulder seams and repeated on the bodice lining except that I made tucks instead of the pleats and darts. Having stitched the shoulder seams of the lining I then placed the bodice and lining right sides together and stitched around the neckline, armholes and down the underlap and overlap on the left side. Having turned through I was then able to stitch the centre back and right side seams together. 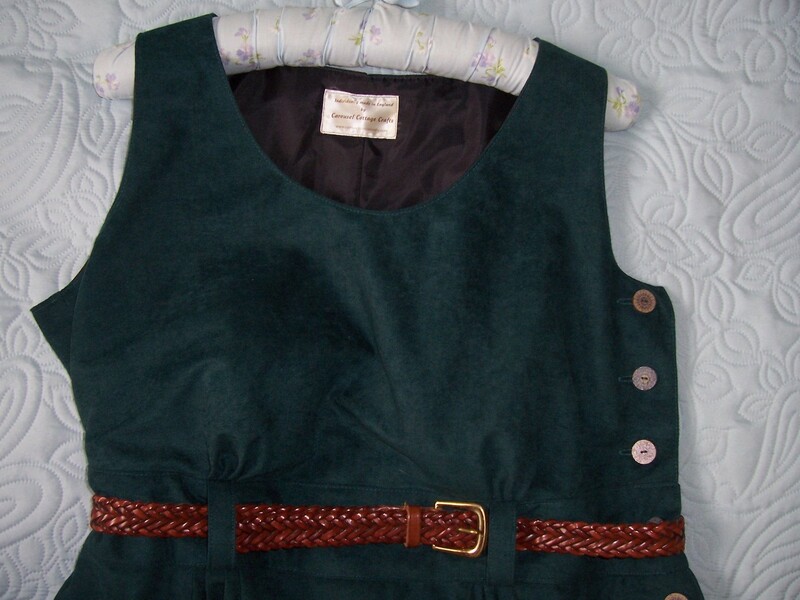 I top-stitched around the neckline and armholes to finish. Then I made a set of belt loops, each 4” long which were attached to the bodice, lined up with the pleats on the front and darts at the back. The waistband sections were joined and the top then tacked to the bottom of the bodice. Time for a fitting – all was well. I made the buttonholes and attached buttons to the bodice before attaching the waistband lining and then made a buttonhole and button for the waistband. Now onto the side seam pockets and skirt panels. The side seam pocket for the right-hand side was plain and simple to sew but it was the one on the opposite side that gave me considerable pause for thought. It was like working out jigsaw puzzle but without the guiding picture to demonstrate what should go where. Eventually I got it sussed and I am absolutely delighted with the finish of the placket and that hidden side seam pocket behind. When attaching the skirt panels to the bottom edge of the waistband I found that the front skirt fitted beautifully, my drafting had been “spot on”. Unfortunately I had been over-generous with the back panel. The dart placement did not line up with the back bodice darts and belt loops and there was way to much fabric at the waistline. I moved and enlarged the darts which I then “hid” behind pleats so that I still had fullness in the skirt. I stitched the lining skirt panels together, not forgetting to leave an opening to line up with the placket. I knew that the hem on the skirt would be 2” so made a double fold hem on the lining to finish 1” shorter. 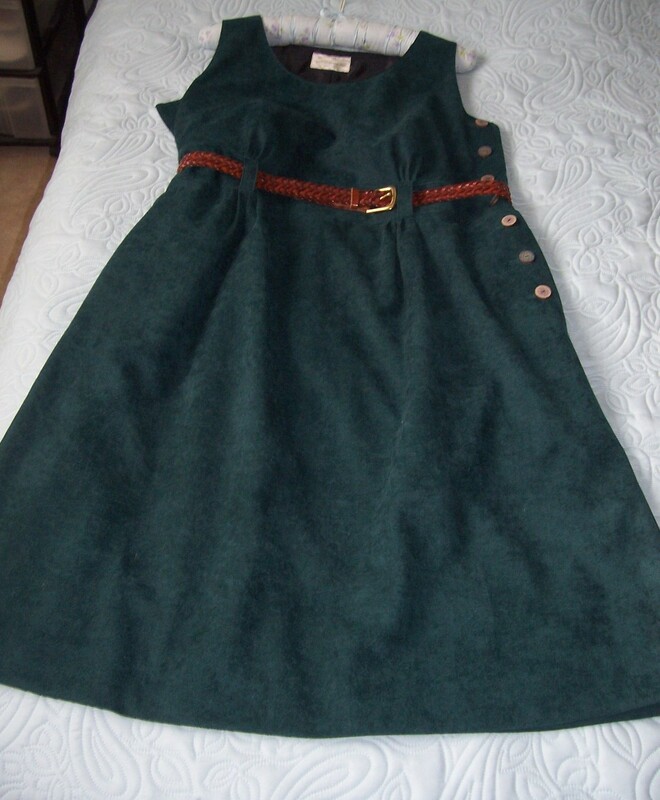 The rest of the construction was simply to add the skirt lining to the waistband seam, pull down the waistband lining to cover the join and top stitch before making three buttonholes and buttons in the skirt placket and hand stitching the hem. I guess that the entire garment has taken about 15 hours which is much longer than I usually take to make a dress, but I do now have a detailed pattern and set of construction details so the next version should take much less time. Finally, having worn the dress for a short time I have decided to forego the patch pockets on this version. Also next time I may well omit the second side seam pocket which did add considerably to the construction time.